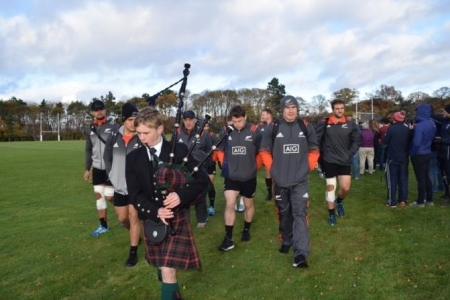 ''Newsletter - All Blacks Visit & Celebrations"
Sunday provided an opportunity to remember the Merchistonians and members of staff who gave their lives in the two World Wars. 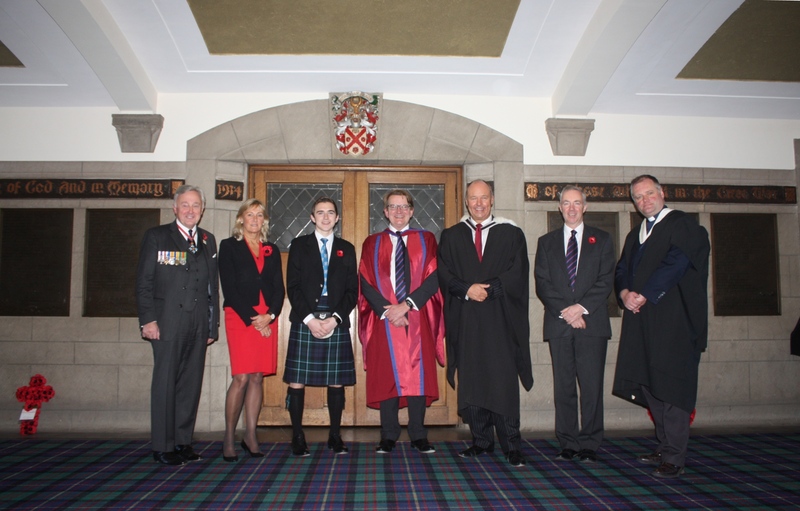 The address this year was given by Dr Michael Carslaw (68-73), Headmaster of St Leonards School, St Andrews. In the section of the service entitled "Merchiston Remembers", the Chaplain, Revd. Nick Blair, spoke about Merchistonians John Michael Paton (34-38) and Robert Donald Brown (28-32), and introduced current Shell pupil, James, to talk about his plan to recruit 100 Merchiston/Merchistonian pipers and drummers to play after next years' service, which will mark the centenary, to the day, of the Armistice. Get in touch if you would like to be a part of what will be a very moving ceremony next year. 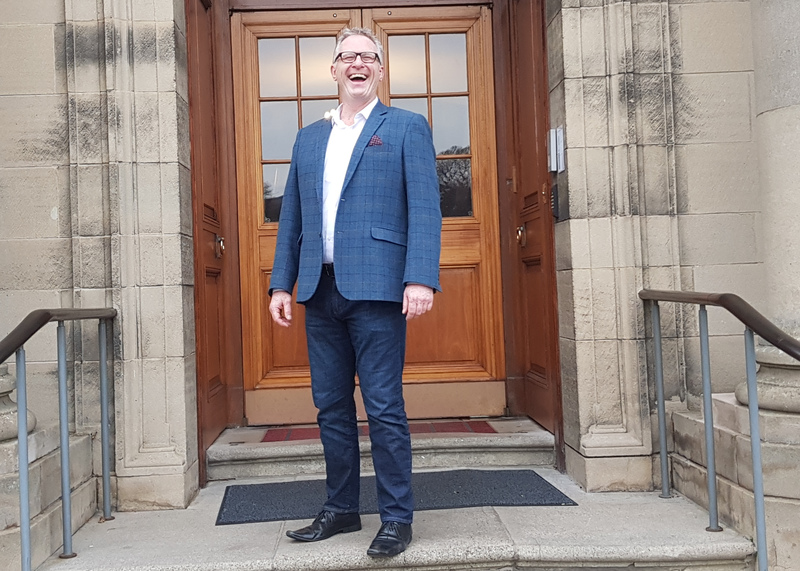 Graham Gibson (83-88) paid us a visit to set about organising a reunion for the Class of '88 next year and the date has just been confirmed, Saturday 8 September. Graham, who had not been to the School since leaving, 30 years ago, enjoyed lunch on the house and was impressed with the quality of the meals now. 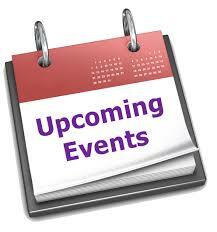 Keep an eye out for your invitation which will come out as soon as we have the finer details confirmed. 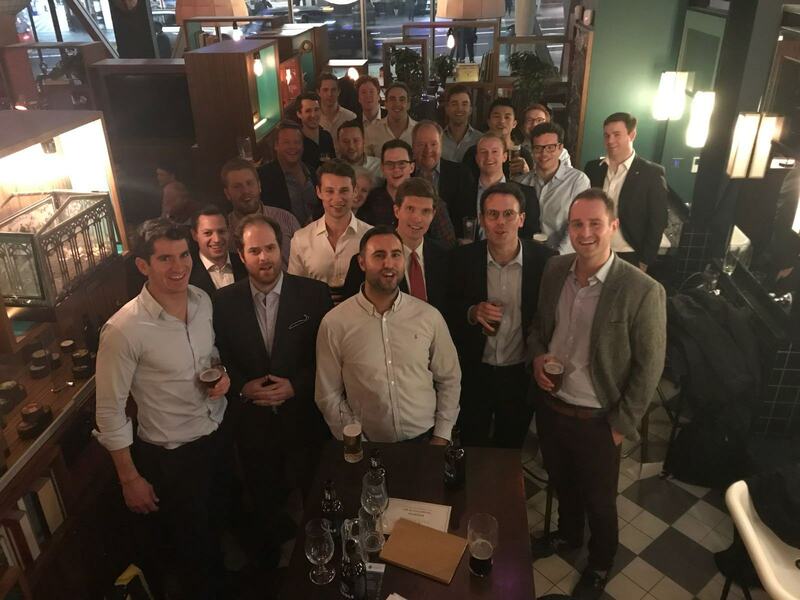 What a great turn out at the London drinks at Greenwood last night. 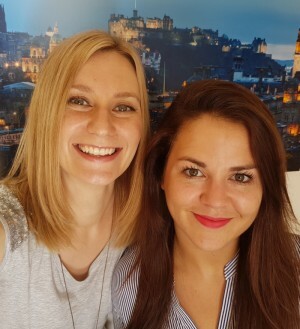 Take a look at the photos we have so far here, and please keep sending more in! 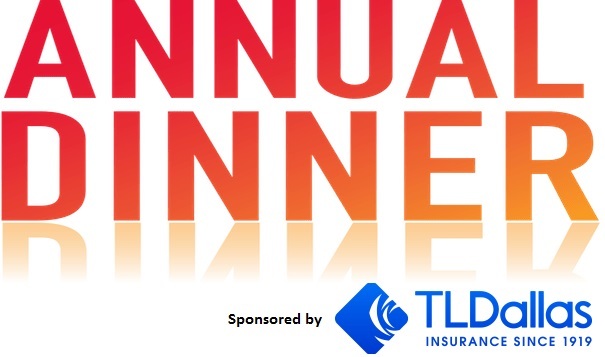 Bookings close on Wednesday at noon for the Merchistonian Annual Dinner next Friday so remember to buy your ticket. 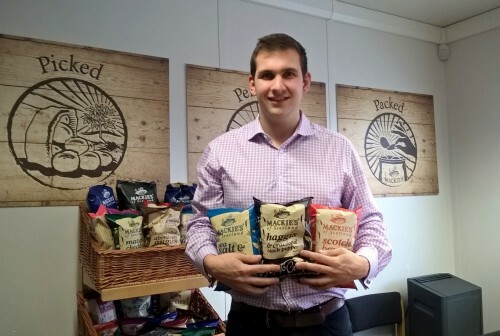 The next BB is with James Taylor (02-07), Commercial Director of Mackie's Crisps on Friday 24 November, 8.00am - 9.00am at Belted Burgers, 57A Frederick St, Edinburgh. James will give us a background on the Mackie's brand, how the crisps side of the business was formed, the current UK retail landscape (including challenges faced from discounters like Aldi and Lidl), and more. If you would like to attend please reply. On Saturday 2 December we are holding a rugby supporters' breakfast before for the games against Watson's. The breakfast will be served in the Old Library at 9.00am and the cost is £5 per head. Please reply to let us know if you will attend and how many places you would like. Date for your diary: Saturday 9 June 2018, Merchistonians will once again take on Edinburgh Accies at Raeburn Place. A match not to be missed! 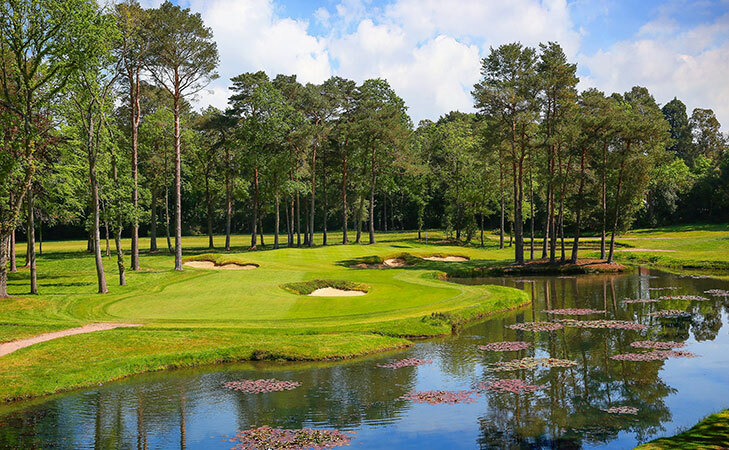 If you would like to play please contact Oli Green (99-07) here. More details will follow. Michael Ferndale (86-92) invites you to the above event. Click here to find out more and to book. 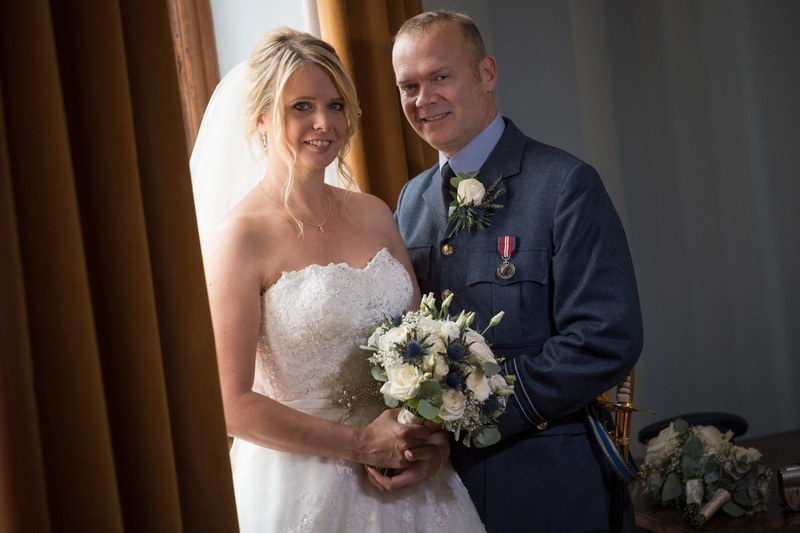 Congratulations to Andrew McGill (84-85) and Diane Carbutt who tied the knot on 23 September at St Michaels and All Angels Church, RAF Cranwell. The All Blacks came to the School this afternoon to train before the big game tomorrow! We waited in anticipation of their arrival in the bitter cold, and judging by their expressions they felt the chill two-fold. Rory played the pipes to give them a very Scottish welcome. Finally, to those who met the Headmaster's at the Hong Kong drinks, we hope you had a great time.